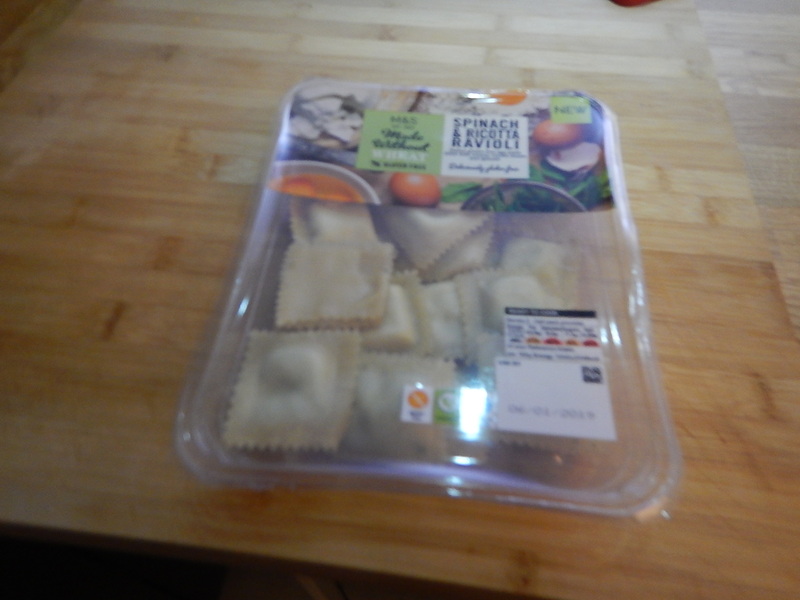 Gluten-free ravioli is one of the foods that I have missed, since my diagnosis as a coeliac. But, I was able to buy this new product this afternoon, at a cost of £3.70 for enough for two. The proof will be in the eating. Since, I moved to Dalston in 2010, my Saturday morning routine has been something like this. Take a 30 Bus to St. Mary’s Church. Visit the Carluccio’s and have a gluten-free breakfast, like a full English or an eggs benedict. Visit Waitrose for half my shopping. Visit Marks and Spencer for my gluten-free shopping. A few weeks ago, new buses started on route 30. I don’t use them, except as a last resort. They were built in Egypt. Now, I’ve nothing against Egyptians or their country, but we make very good buses in this country and we should have British buses for British bottoms! The new company running the route seems to not provide the same frequency anyway, so catching a 30 bus, would often involve a longer wait. But the need to take a 30 bus decreased, a few weeks ago, when Carluccio’s in Islington closed. As there is no other place in Islington to get a quick gluten-free breakfast, that put a big hole in my Saturday mornings. I could go to Bill’s or Cote, but they take a lot longer and are much more expensive. Waitrose too, are annoying me. They have redone their self-service tills and they are useless for my way of shopping. I have a large reusable M & S bag, that folds into my man-bag and although it was fine for their original tills, it’s too big for their new tills. So to shop in Waitrose, I put the bag in the trolley, load my purchases onto the till without a bag and then after payment move them into my shopping bag. How inefficient is that? I now limit my purchases at Waitrose by using the much-more customer friendly Sainsburys next door. Anyway, Sainsburys have a much better gluten-free selection, than the terrible range in Waitrose, where no care is taken to make ranges of foods like sausages and burgers gluten-free. In fact, I wouldn’t trust Waitrose on their allergen philosophy. The labelling might be correct, but it’s all about how different product types and ranges are handled. You wouldn’t shop in Waitrose if you were a family with one member who was coeliac or gluten-free! Marks and Spencer at the Angel carry on as normal, as they have done since my paternal grandmother shopped there ibefore the First World War and, when C and I used to shop there in the 1970s. But they have competition in that I am ringed by others of their stores in Dalston, Finsbury Pavement, Kings Cross, Liverpool Street and London Bridge. Yesterday, I ate breakfast in Leon at Kings Cross and then roamed the shops before doing my Saturday shopping in their Finsbury Pavement store. That one is now opening on Saturdays and I can get two buses directly from the store to the zebra crossing by my house. All of these factors are combining to make me use Islington less. What the Angel needs is a Leon, so I can have a fast gluten-free breakfast on the go. One of the great things about breakfast in Leon, is that there is often time and space to layout your tabloid-sized newspaper and eat a leisurely breakfast. I am not the largest of individuals being around one metre seventy and sixty-one kilos. But then many coeliacs are on the smallish side. 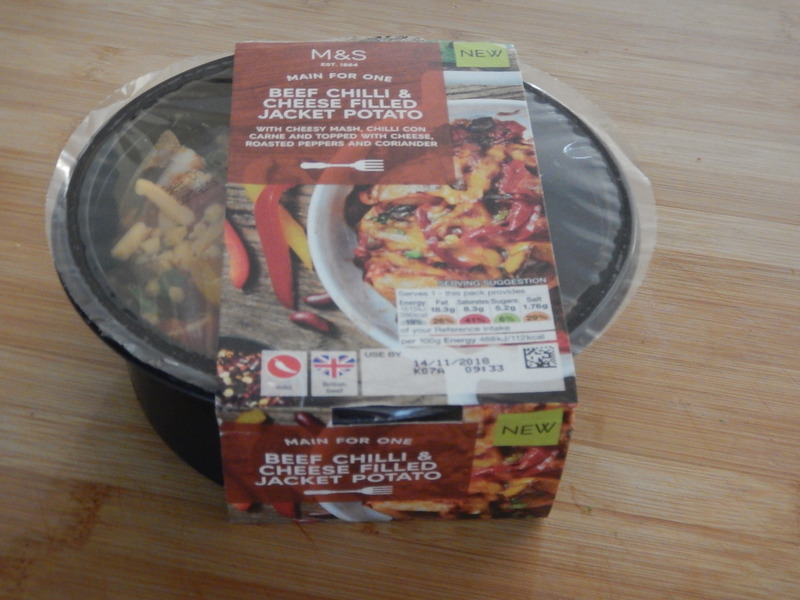 So when I saw this small meal which was entiled Beef Chilli & Cheese Filled Jacket Potato, I suspected that it could be gluten-free, as it seems most of Marks and Spencer’s beef chillis are made without gluten. On turning the packet over, I found my reasoning was correct, as the dreaded g-word was missing. Next to this baked potato on the shelf, was a Smoked Haddock Mornay Filled Jacket Potato. Some of their fish dishes with a Mornay sauce are gluten-free and others are not. This was one of the ones with gluten! Surely, if all chillis can be gluten-free, then all fish Mornays should be the same as to gluten. Perhaps, all baked potato dishes like this should also be the same as to gluten. I also think that with fish, shepherds and cottage pies with a potato topping, whether a pie is gluten-free or not depends on the range. And with sausages and burgers, they are all gluten-free. If you are vegan or need to be dairy-free, I’m certain there are other examples of similar products varying as to acceptability. Not bad at all! I’ll try another, but I would love to try the smoked haddock variety! This article on the BBC is entitled Should There Be A Tax On Red Meat?. A “meat tax” could prevent almost 6,000 deaths per year in the UK, according to researchers, but should politicians be telling people what they can and can’t eat? Scientists at the University of Oxford say governments should consider imposing price hikes on red meat – such as beef, lamb and pork – to reduce consumption. They also go on to suggest these levels of tax, with examples. In the UK, the study suggests a tax of 14% on red meat and 79% of processed meat. And for a pack of eight pork sausages from Sainsbury’s the price would increase from £1.50 to £2.69. It is probably peer-reviewed research, but I doubt it would ever be introduced. Would I As A Coeliac Get Extra Tax Relief, As I Need To Eat Red Meat? 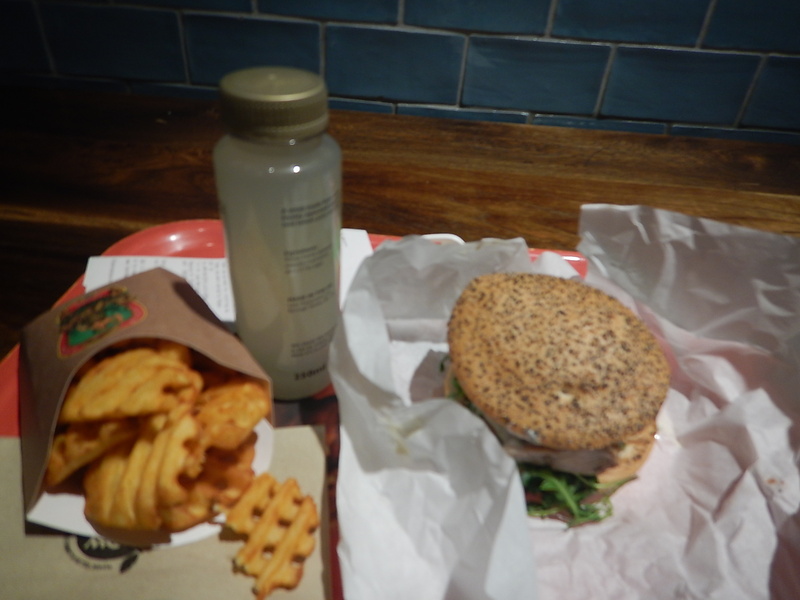 I don’t eat much red meat, but to keep my B12 at a good level, I need to eat a quality steak or burger. Regular levels of B12 help to keep your immune system strong, which is the body’s first line of defence against cancer. Why Do Coeliacs On A Gluten Free Diet Have A 25% Less Chance Of Getting Cancer? Research at Nottingham University has shown this. Being coeliac is unlikely to be beneficial, as whoever heard of a disease that let you live longer? ,So could it be the non-eating too of gluten? Research needs to be done that considers consumption of red and processed meat, taking eating gluten into account. How Would I Reduce Cancer? There are other substances and circumstances that are proven to cause cancer. Smoking tobacco and other drugs. Gas appliances in the home, not venting outside. Some of these also cause other health problems. I’d start with absolute bans on these. Sales of high strength alcohol. Jobs with a proven record of causing cancer like coal mining. And these things would be compulsory or introduced. Everybody should keep a record in a smart-phone app of what they ate and their weight. Owning a diesel or petrol vehicle would need a special permit. Alcohol could only be bought in special licensed shops. Obviously, other draconian measures could be introduced. I doubt it will ever be acted upon, by any Government that wants to win an election. So What Can We Do That Is Practical? My view is that we have to nudge people into doing the right thing. Note that I use the term zero-emission vehicle, which is a category that includes battery and hydrogen power at present. But it is a class, that could include other vehicles in future, that have yet to be invented. If diesel and petrol taxes were to rise and the revenue were used to subsidise the purchase of zero-emission vehicles, then this might persuade more people to switch to zero-emission vehicles. Money could also be allocated to research into zero-emission vehicles. London is getting an Ultra Low Emission Zone, but this is only the start. They should be Zero Emission Zones. They should probably be paired with parking areas outside the zone and connected to it, by a zero-emission high quality rail or bus link.The link could be a segregated walking or cycling route. The first town or city that uses this model to create healthy air quality will probably reap an enormous dividend. From recent developments, I suspect it will be the City of London. As smoking had a lot to do with the death of my son I feel strongly about this. My wife also may have died from secondary lung cancer. But she had never smoked, although she got enough cigarette smoke from her tutor at University, who chain-smoked Capstan Full Strength. Is There A Radical Approach? Liverpool University Pancreatic Cancer Research Unit have one of the most impressive databases I have ever seen! It contains every pancreatic cancer case, that has been notified to the University. They use it to look for links between factors, that might be a clue to what causes this terrible disease and for possible cures. But imagine an enormous database of all UK cancer cases, that was processed to show how the cancers related to post codes, occupation, age, weight, smoking and drinking habits etc. Access to an anonymised version of the database would be allowed through the Internet or a phone app. Would access to the data, nudge people to change their bad habits? I also know of ten-year-olds, who pester their parents to stop smoking, so imagine what a tech-savvy child would do, if given access to the app. Schools could teach them to use it responsibly. Could it bring the whole country together to reduce levels of cancer? When I first saw this headline, I was surprised and cynically felt that this was some put up job paid for by the producers of fish fingers or the Fish Fingers Appreciation Society. But it appears that the research was done by the Marine Conservation Society. This is the first paragraph of their Wikipedia entry. I think that and other facts in the entry, prove that we can take the BBC report at face value. Incidentally of their list of the top fifteen fish fingers rated for sustainability, at least two were gluten-free. Usually, coeliacs and others who are gluten-free are left out of the results. My last thought, is that why if we can make fish fingers surprisingly sustainable, can’t we do that for other foods?